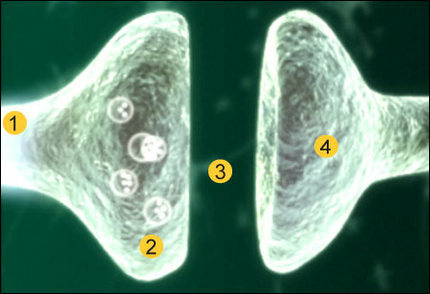 If you can label the 4 parts of the diagram shown here and describe what is happening you have figured out how neurons work!. ​Hint: Use the phrase action potential in your answer. Neurons are the parts inside your brain that help your brain work. A good analogy would be to think of your brain as a rice pudding and neurons as the rice. Without neurons, there is not much of your brain left! This section of your study into neuroscience involves you learning about the structure and functions of a neuron. The website Neuroscicence for Kids has a number of activities that you will work through. Some of these are MUST DO's and some are CAN DO's. What the parts of a neuron looks like AND how a neuron works to pass messages around the brain. Which of these youtube clips do you think best explains neurons and neurotransmitters?